HELMHOLTZ, Hermann von. 18003 Original Envelope, addressed by Helmholtz to Professor William Knight at St. Andrews. Not signed. 4 x 5 inches, in good condition. 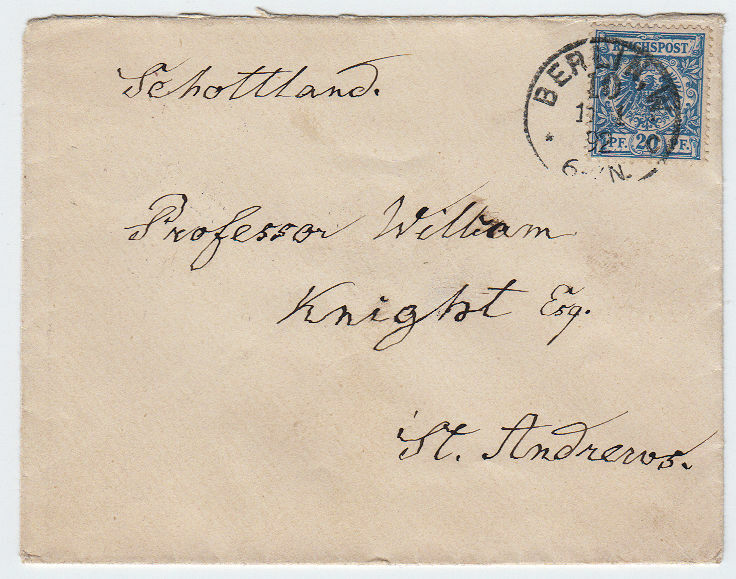 Postmarked Berlin, 1 January 1892. Hermann von Helmholtz (1821 – 1894), German physician and physicist who made significant contributions in several scientific fields. The largest German association of research institutions, the Helmholtz Association, is named after him. As a philosopher, he is known for his philosophy of science, ideas on the relation between the laws of perception and the laws of nature, the science of aesthetics, and ideas on the civilizing power of science. Professor William Angus Knight (1836–1916), writer and philosopher.